The Japanese Village was a popular attraction at San Francisco's California Midwinter International Exposition. Covering approximately 1 acre, the village contained a traditional Japanese garden.....with koi pond, waterfall, stone lanterns, and bridges.....2 teahouses, a Japanese theater, bazaar, and a traditional-style Japanese home. The pine trees in the garden, which pre-dated the exposition, were pruned & thinned to resemble Japanese pines. At the close of the Midwinter Fair, a decision was made to preserve the Japanese Village and it soon became known as the Japanese Tea Garden. For many years it was maintained by the Hagiwara family, who lived in a large residence that they constructed at the rear-portion of the garden. Over the years the garden was expanded to an area of over 5 acres, and many other features were added, such as a Shinto shrine, pagoda, and stone lanterns of various sizes and styles. The landscaping was meticulously maintained and was much admired by visitors. 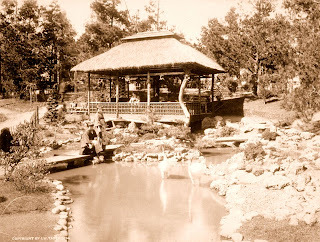 Below is a view of the original teahouse and pond, as they appeared in 1894.....contrasted with a similar view in 2008. 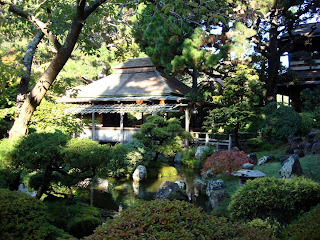 The garden is treasured by the citizens of San Francisco, and continues to be a popular attraction in Golden Gate Park.